Rock Creek Park is accessible from campus by foot and is one of D.C.'s outdoor escapes from city life. If you chose to attend GW, chances are that a sprawling, outdoorsy campus was not a high priority. But if you’re craving a bit of fresh air, there are plenty of forests, trails and parks that you can access by foot near campus. And if you’re ready for an adventure, Rent a Zipcar or splurge on an Uber and get out of the District for even more natural beauty. Not sure where to start? TRAiLS, GW’s outdoor adventure organization, leads frequent trips to all of the places on this list and more. For about $10-20 per trip, TRAiLS offers easy access to the beautiful world outside campus. Roosevelt Island is a quick and easy escape from Foggy Bottom that is even visible from the Georgetown Waterfront. With three short trails that wind around the island, this is a perfect place for beginning hikers or more adventurous picnickers. The center of the island has a pavilion dedicated to Teddy Roosevelt, making it one of the lesser-visited monuments in the area. Get there by crossing the Theodore Roosevelt Memorial Bridge (entrance behind the Kennedy Center) and heading to the Mount Vernon trail. Most students who live on the Mount Vernon Campus never venture farther than Safeway. But just a few more minutes’ walk down MacArthur Boulevard, and a world of natural wonder awaits. Battery Kemble Park was a Civil War defense site for the Union Army, but is now a dog park for pooches of the Palisades. The surrounding trails are great for hiking and running, and they connect to Rock Creek Park and Dumbarton Oaks. 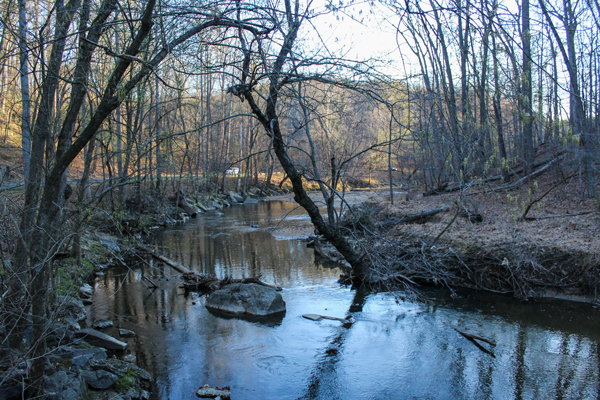 With more than 30 miles of trails, Rock Creek Park is D.C.’s largest hiking network. Beautifully bikeable, the paved park trails provide endless opportunities for explorers on two feet or two wheels. If you are looking for more than hiking, Rock Creek Park’s nature center has a planetarium with weekly programs, horseback riding lessons and a summer concert series at the Carter Barron Amphitheatre. While you’re there, check out one of D.C.’s best-kept secrets: the stones of the old Capitol building that are mysteriously arranged in the forest. The world-famous Skyline Drive in Shenandoah National Park is accessible just an hour and a half outside D.C. Enjoy hiking trails, spectacular views of the River Valley and plenty of wildlife. The drive is the only public road that goes through the park, and is 105 miles of 75 overlooks. If cruising the open road is your therapy, Skyline Drive is the ideal spot to roll down the windows and crank the road trip tunes. How low can you go for adventure? This cavern tour takes you deep underground, through the incredible natural rock formations below the surface of the earth. Luray Caverns and Skyline Caverns are two options in Virginia that are easy to tack onto a day at Shenandoah. Because the caverns are isolated from the elements, you can go in rain or shine. Admission ($18-$26) buys you an hour-long tour with a knowledgeable guide. As a bonus, this tour is a great way to study for your geology final. These local waterfalls are so stunning, you won’t believe they are just a few miles away from Foggy Bottom. With entrances on both the Maryland and the Virginia sides of the Potomac River, Great Falls Park straddles the river as it gains speed and passes through Mather Gorge. The surrounding park is 800 acres and offers hiking opportunities for all levels of hikers, including the highly challenging Billy Goat Trail. Both entrances are about a half hour outside of D.C., and the Maryland side is easily accessible by bike.